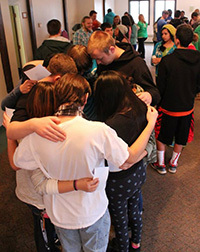 More than 60 "die to self" at Teen Prayer Summit at GVR » During last weekend's RMC Teen Prayer Summit at Glacier View Ranch, participants were encouraged to "die to self" daily. The theme of the event, "This is Your Time," focused on the history of Christian martyrs. More than 60 students and adult attendees learned that martyrdom is not limited to a physical act at the end of one's life, but happens as we daily choose to die to our sins and let Christ live in us. Everyone in attendance expressed a desire to die to self. Jordan Reichert, a senior religion and history major from Southern Adventist University, shared moving presentations about what it means to be willing to die for something you believe in. One of the most meaningful parts of the weekend occurred on Saturday night when numerous teens gave spontaneous testimonies. To view a photo album of the weekend event, click here. Campion Church to host Adventist History church service » On March 1, students at HMS Richards Adventist School will present the church service at Campion SDA Church. The program, shared in song and drama, will focus on Seventh-day Adventist history, as inspired by Norma J. Collins' book, Heartwarming Stories of Adventist Pioneers, You Will See Your Lord A-Coming, which is part of the school's reading curriculum. Following the service, HMS Richards Adventist School will host a potluck in the school's gym. It is the students' desire that this program will place in your hearts a strong commitment to finish God's work, begun in a humble cornfield in 1844. All are invited! Campion SDA Church is located at 300 42nd St. SW, Loveland, Colo. For information, please email [email protected]. Twin Peaks students provide water for Africa » The Kindergarten class at Twin Peaks (Louisville, Colo.), headed by Marlea Mehner, begins each new year by eagerly choosing an ADRA (Adventist Development and Relief Agency) project. 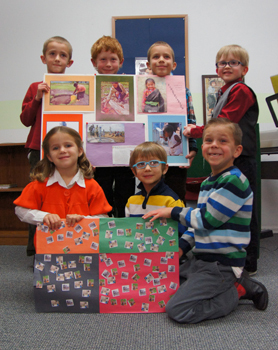 They set a high goal, and then work to raise funds. In 2013, the class—consisting of up to 13 boys, ages 4-6—chose to help fund a fresh water well that serves 2,500 people in Cameroon. Each well costs $16,000, but the boys were undaunted, and they raised more than $600! Only in the world to come will these young, mission-minded boys realize what their gifts have accomplished. If young children can do this for the Lord, what can you or I do?